Meet the new generation of PTV Vissim – with additional features and improvements to further enhance your experience. PTV Vissim 11 provides you with in built driving behaviours to model automated vehicles, new visualisations and flexible routing options. Check out the "What's New Document" and our webinar to learn more about all new features. Want to try all the new features yourself? 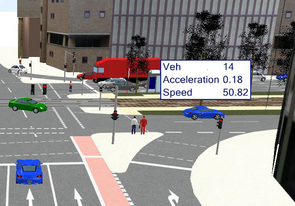 Take a look at our latest PTV Vissim version and test it 30 days for free. With PTV Vissim 11 you are well prepared for the introduction of connected and autonomous vehicles (CAV). This release provides you with multiple additional attributes in the driving behaviour dialog that can be used to model CAV’s. It’s now simple to model these vehicles without scripting or programming. The driving behaviours have been calibrated based on real world data collected from a public test track as part of the CoExist project. The new attributes reflect the use of braking assistance or the fact that connected vehicles need less distance between each other. The attribute “use implicit stochastics” models the imperfection of human drivers. It can be switched off when modelling CAVs. It’s now possible to change or add attributes to vehicles as they’re moving in the simulation. With vehicle attribute decisions, which are placed on links, all or selected passing vehicles types can be assigned a new attribute either as a fixed value or a random value from a specified distribution. This allows for example the number of passengers in a vehicle to be varied in specific locations and times of the simulation. Static and partial vehicle routes and partial PT routes can now benefit from a user-defined formula-based route choice method. The route formula can use attributes of passing vehicles, as well as other network object attributes to alter routes of vehicles. For example, at a toll plaza vehicles can be routed to certain booths based on their payment method, or at an airport to a specific entrance depending on the departing airline. In PTV Vissim 11, add labels to vehicles in the 2D view enabling so you can see any attribute info in real-time such as current speed. The labels move with the vehicles during a simulation run and can optionally rotate with the driving direction. In addition, 3D information signs have been introduced as new network objects. They show fixed text and/or attribute values and positioning of the sign can also be configured.